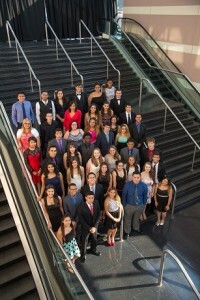 Ibero American Action League Inc. recognized 61 high school seniors from the class of 2015 for their academic achievements at Ibero’s Annual Gala and Hispanic Scholarship Recognition Awards, Saturday, June 11, at the Rochester Riverside Convention Center. According to officials, each student received at least one college scholarship, made possible by Ibero, and several other businesses and organizations in the Rochester area. Wegmans, The Bonadio Group and Usherwood Office Technology sponsored the event. According to Ibero, the organization’s scholarship application process required students to demonstrate high academic achievement, community engagement, and leadership qualities. In addition, a scholarship committee, consisting of professionals in the Latino community, ranked and selected the students who received the awards. 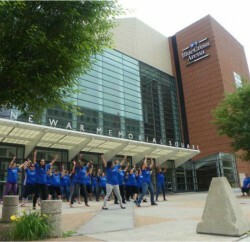 The organizations which donated to Ibero’s scholarship fund included Ibero; The Greater Rochester Health Foundation; Conserve; Dale Carnegie Rochester; Excellus; First Capital Payments; Rochester’s Cornerstone Group; the Rochester Hispanic Business Association; the Rochester Latino Rotary Club; the Puerto Rican Festival; the United Way’s Latino Leadership Development Program; and several individuals who had partnered with the organization to provide scholarships for the first time. High school students in the 2015 scholarship group attended schools in the Rochester City School District, Brighton, Gates, Geneva, Geneseo, Greece, Hilton, Honeoye-Falls Lima, Irondequoit, Leroy, Midlakes, Penfield, Pittsford, Victor and Webster. Officials said each student had to submit an application, with supporting documentation, including recommendation letters and essays. In addition, the students also demonstrated profound experiences, and came from diverse ethnic backgrounds. New York State Comptroller Thomas DiNapoli served as keynote speaker for the gala, in place of Yulín Cruz Soto, the mayor of San Juan, Puerto Rico. According to officials, Cruz Soto had previously been scheduled to deliver the keynote, but canceled due to Puerto Rico’s debt crisis. Established in 1968, Ibero is a dual-language human services agency which has worked with people of all backgrounds. Through hands-on learning, Ibero has helped children, youth, families and individuals with developmental disabilities transition into the classroom, the workforce, and the community.